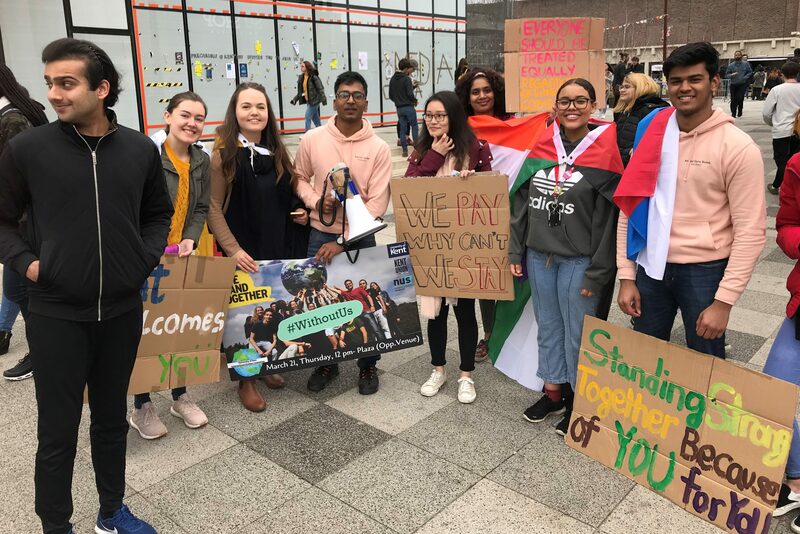 International students organised a rally at the University on Thursday 21 March in support of a campaign for a change in the visa rules governing work after study. Students gathered at Kent&apos;s Canterbury campus student plaza to demonstrate for the government to re-introduce the Post-Study Work Visa (PSWV). This enabled students to remain in the UK for two years after their studies on a student visa, rather than requiring a separate visa, but was closed in 2012. The March of Unity: We Stand Together (#WithoutUS) demonstration saw both overseas and UK-based students take part and organisers Kent Union and the International Students Kent society said the event was well-attended. Aarish Hyder, Kent Union&apos;s International Students&apos; Officer, said: &apos;As the International Students&apos; committee, we have not backed down on campaigning and representing the views of students. We campaign on issues that affect both EU and non-EU students and work closely across NUS to ensure that international students&apos; voices are heard across the different campaigns.